Mercedes Benz C63 AMG at Tint Magic Window Tinting. Call us for a free estimate! (954)840-7883. We are located at 11344 Wiles Road Coral Springs,Fl 33076. 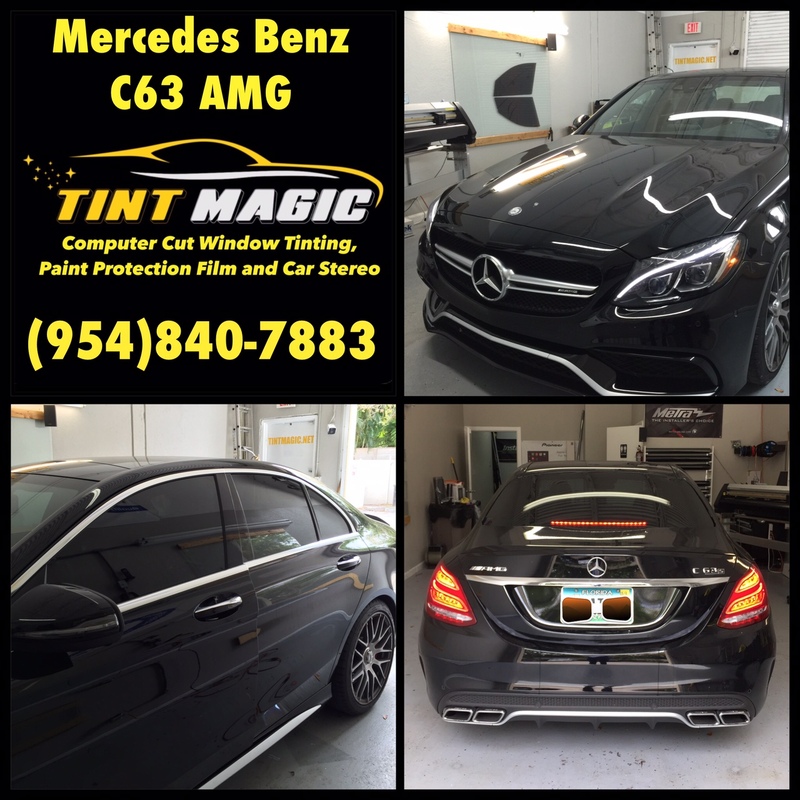 Mercedes Benz C63 AMG at Tint Magic Window Tinting located at 11344 Wiles Road Coral Springs, Fl 33076. Call us for a free estimate! (954)840-7883. Big things, meet small package: The C43 and C63 cram a whole lot of horsepower under the compact C-class hood. The 3.0-liter twin-turbo V-6 in the C43 sedan makes 362 hp and drives all four wheels through a seven-speed automatic transmission; coupe and convertible get a nine-speed auto. Step up to the racier C63 sedan or coupe and revel in 469 hp from its 4.0-liter twin-turbo V-8; a seven speed automatic and rear-wheel drive are standard. Craving more? Try the C63 S; it gets a bump to 503 hp. Can’t decide whether you would prefer a boulevard cruiser or a high-performance sports car? No need to choose if you can plunk down $75K or more for the latest from Affalterbach, the city just north of Stuttgart where AMG’s engineers and designers have whipped up a pair of dual-purpose, leather-lined missiles in the Mercedes-AMG C63/C63 S cabriolets. Featuring chassis and powertrain technology from the just launched C63 coupe, the droptop editions also get considerable body and suspension alterations. Both employ versions of the M177 4.0-liter V-8, the compact “hot-V” design with two turbochargers mounted between the cylinder banks. Rated at 469 horsepower and 479 lb-ft of torque in the C63 cabriolet, or 503 horsepower and 516 lb-ft of torque in the C63 S cabriolet, this engine works through a seven-speed “Speedshift” automatic that delivers ultraquick gearchanges and rev-matched downshifts. All power is sent to the rear wheels. Mercedes-AMG says that 60 mph comes up in 4.0 or 4.1 seconds. While the C63 cabriolet is governed at 155 mph, the C63 S allows a more generous 174 mph. AMG has opted for extensive suspension revisions from the standard C-class fare: Both the multilink suspension setups at the front and rear axles are designed to keep body roll to an absolute minimum, and the AMGs have a wider rear track than any Benz-branded C-class cars. The stability control system offers three settings, and so does the steering; there are four for the powertrain (Comfort, Sport, Sport+, and Race). Steering with the throttle will be an option for those who know what they’re doing behind the wheel, aided by a standard mechanical limited-slip differential on the C63 cabriolet or an electronically controlled unit on the C63 S. The S model also gets electronically controlled engine mounts, which stiffen during hard cornering. The standard C63 cab comes with 255/40R-18 front and 285/35R-18 rear rubber; the C63 S wears 255/35R-19 tires up front and 285/30R-19 at the rear. And there is a wheel-and-tire package that combines the 255/35R-19 front tires with 285/30R-20 rear tires. Carbon-ceramic brakes are optional on the S. In addition to their benefits on back roads and racetracks—if one were to actually lap one of these—the brakes, wheels, and tires also look particularly good.